Bedrock's Cairn Pro is an unusual take on a minimal sandal. 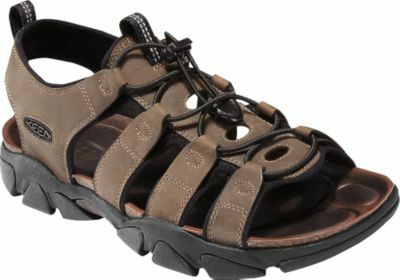 The most important distinction is the strapping, which is unlike any other sandal I have worn. 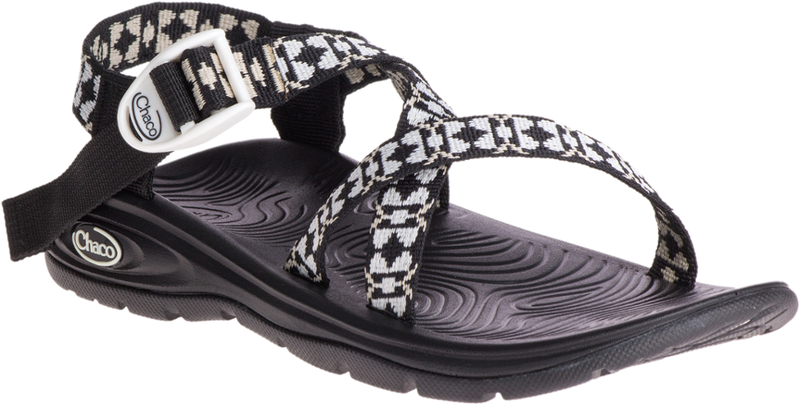 For such a light sandal, the secure feel of the strapping and grip of the sole make these great for light hiking and being in and out of the water. The price and single front toe cord would be the primary bugaboos for some people. The Bedrock Cairn Pro is a lightweight sandal that swings well above its very low weight thanks to a fairly unique strap design and sole. I have never seen or worn the regular Cairn; the only difference between the regular Cairn and the Pro version is the material used for the sole. The Pro sole uses rubber that is supposed to be very sticky in wet, slick conditions. I live near the Potomac River and spend a lot of time in and around the water, so the extra few dollars for the seemed worthwhile. Bedrock makes its sandals in Northern California; the primary place to buy sandals from this Kickstarter-funded small company is via their website, but they also sell at a series of independent outdoors stores around the country. REI recently started selling them too. To put the weight in perspective, my size twelve pair of Cairn Pros weighs one pound on a digital scale—for the pair. My Chaco Z/2 sandals weigh 1.9 pounds for the pair. Cost might be an issue; for this price, you can get a much more sandal, thicker sole etc. for about the same price. 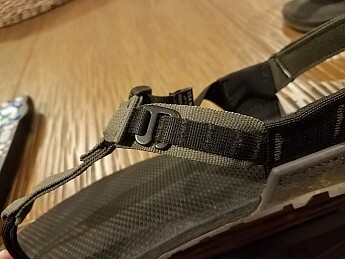 The basic layout of the straps is two skinny pieces of cord between your big toe and second toe, a strap that runs straight back to your ankle, and two straps that go around each side of your foot. The heel strap is adjustable via hook and loop; once you adjust that heel strap to fit your foot, you don't really need to adjust it again. The cords between your front toes are like a typical pair of flip flops, except they are firm nylon cord. I initially thought they would be uncomfortable, and I can definitely feel them on a big downhill. Overall, though, I do not really notice the cord. The only situation where the between-the-toes thing was an issue occurred during a half-day walk by the ocean during a storm. The sandals (and everything else) were drenched, sandy, and salty, and the cord rubbed a raw area near to top of my 2d toe. That's once over 3-4 months and over 100 miles in them, and I would have blistered in any sandal under those conditions. The straps on either side of your ankle are both adjustable. On the inside of your ankle, a small metal piece can fit into a series of "slots" separated by heavy stitching. The photo below shows that pretty well. 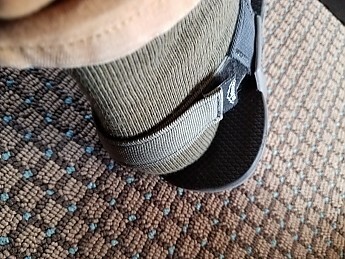 Like the heel strap, this is something I fitted when I first started wearing the sandals, adjusted once, and hasn't been changed since. The metal piece is very secure and has never slipped out. On the other side, the strap runs through a slider. This is a basic feature you see on lots of water sandals and is the primary way I take the Cairns on and off. The straps are easy to adjust to get a good fit. They are skinny and not padded in any way; interestingly, though, I have never gotten a blister in them despite many miles of walking. The sandals run true to size, so mail ordering should not be an issue. Whether you will like the sole/midsole combo on this sandal depends on what you want. If you like a thicker, contoured sole with at least a little arch support, you may not like the Cairn's flat profile. The Cairn has zero arch support. 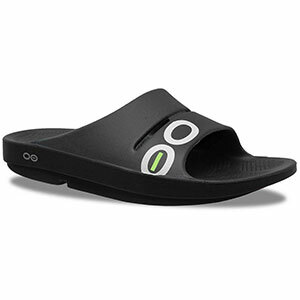 Also, this is not a good sandal for people who want a cushy midsole under their feet. The sole and midsole combined are thin, about 1.3 centimeters thick (about half an inch). The midsole is firm. 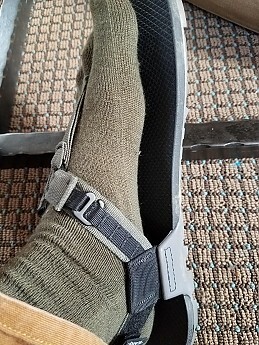 Putting the sole in perspective, they are quite a bit thicker than the lightest minimal sandals or any of the Vibram FiveFinger shoes, and at least half as thick as the heavier sandals. 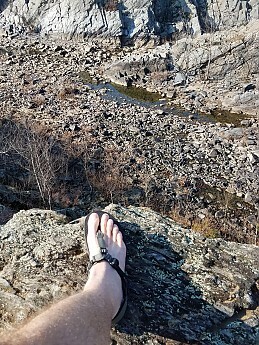 I normally don't use sandals like this to hike on steep or rocky terrain, but I usually take every sandal I test on at least one hike like this to test the limits. 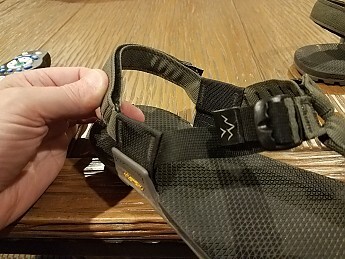 One thing I noted throughout is that this sandal has exceptional lateral stability and better-than-expected protection from pointy rocks for a relatively thin sole. But, don't expect the same kind of insulation from the ground that you get from thicker sandals like a typical Chaco, Teva, or Keen. Traction is really great. 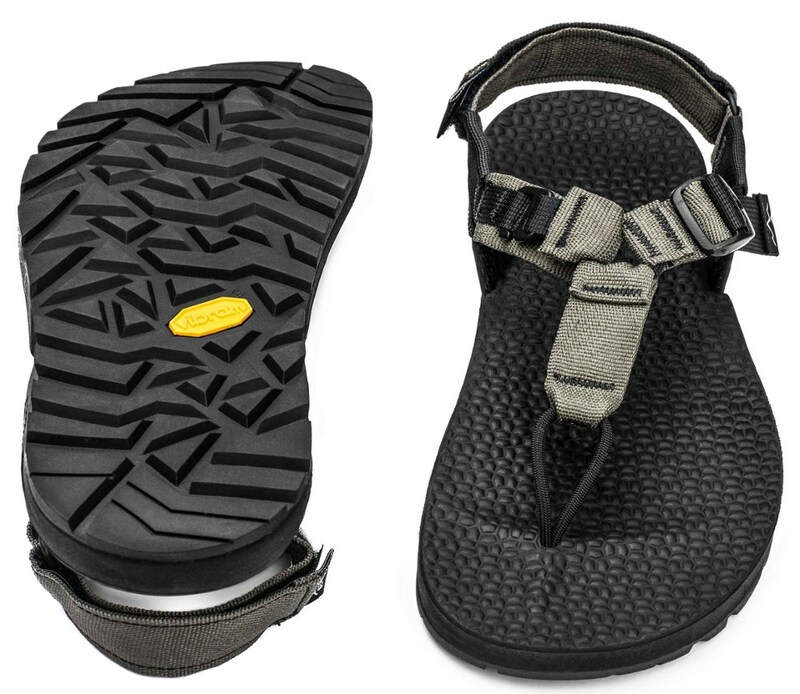 The soles are Vibram Megagrip rubber, the same material Chaco uses on their Pro models; it is similar to stealth or spider rubber made for walking on wet or slimy river rocks and rock climbing shoes, so it should be as good as any sole for being around the water. These performed well on a number of rock scrambles, except that the sole isn't nearly as thick or firm as an approach shoe. Now that I have had more opportunity to wear them on wet/slick river rocks, the soles have proved to have outstanding grip. 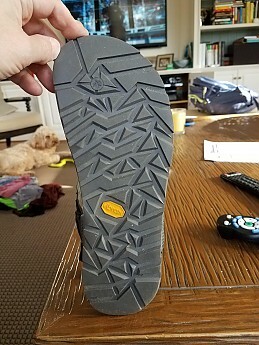 I recommend spending the few extra dollars for the 'pro' grippy sole. For a thin sole, the grooves in the sole are deeper than I expected. If anything, they are deep enough to collect some mud on wet trails, and they are good on sandy and gravely trails, as well as smooth rock. Because I have primarily worn the Cairns during colder months (you can see I often wore them with toe socks), I have had few opportunities to use them in wet conditions. This is not a sandal one wears if looking for lots of support. 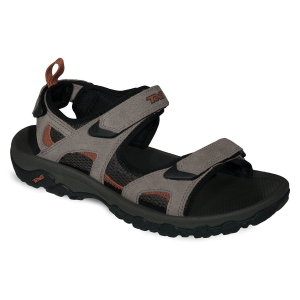 Instead, this is a good choice for someone who is looking for something that feels closer to walking barefoot but offers a more secure and protective sandal than the majority of minimalist options. Also, on downhills, the cords between your toes can exert some pressure sometimes. 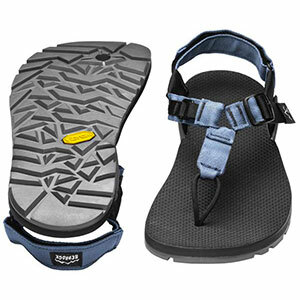 It's one reason you might choose a boot or more robust sandal for difficult terrain than a minimal sole shoe like this. I received these sandals in November and have worn them frequently this winter, as we fortunately have seen little snow in Maryland. 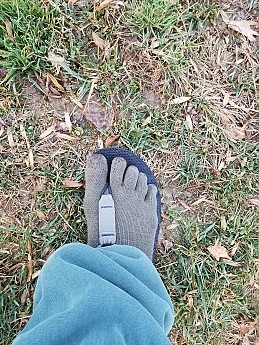 I have a number of different Injinji toe socks that work well with the Cairns, and one clearly needs a sock with separate toes for these. 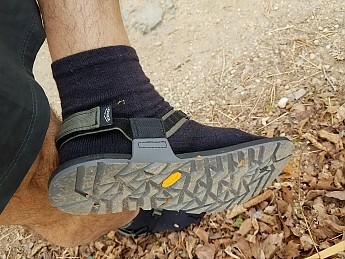 With a pair of wool (Injinji calls them 'nuwool') socks, these are comfortable to the low 30's, so long as you don't take very extended stops and don't soak your feet in a puddle or a stream. 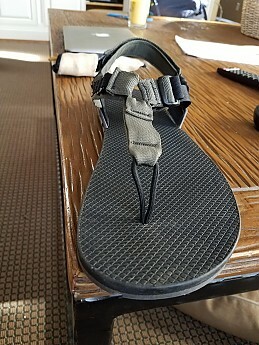 The photos throughout this review show how well these sandals are stitched together. Likewise, the polyester straps, midsole, and sole appear made to absorb a lot of punishment. After lots of walking over a few months, sole wear is limited to a little bit at the heel. The cords between your front toes are attached some some sort of hard plastic piece that is embedded in the sole; on cheap flip flops, the toe piece can be a weak point; it looks like a strength on the Cairn. 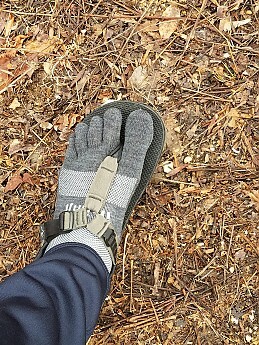 I have worn these for at least two dozen walks and hikes and have worn them all day during some warmer weekends. Most of the walks were on dirt trails in woods near our house and a dirt/gravel towpath near the Potomac River. 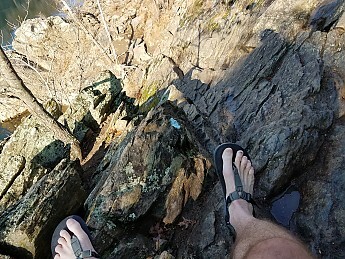 The rocky trails pictured here are along the Potomac. As the weather got warmer, I was able to wear these sock-less all the time and get them in the water. 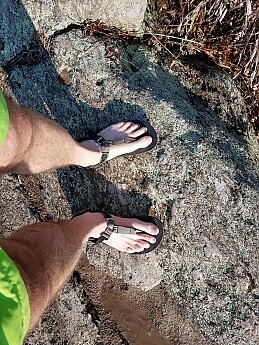 I have been very pleased with their traction on wet rocks, and the skinny polyester straps (limited padding) dry quickly. For heavier backpacks and rougher trails, I wouldn't recommend wearing any sandal—go for a pair of trail runners at a minimum but think about using a sturdier pair of shoes or boots. For lighter loads, easier trails, warmer weather, sports around the water, or as a very light camp shoe, the Cairns are comfortable, versatile, unusually stable for a minimal sandal. In particular, if you are trending toward less support (if a thick-soled sandal bums you out) and a quasi-barefoot feeling sandal, you should really check these out. Nice review Andrew. I will consider these as a lightweight option...like you note I prefer ones that allow normal socks to be worn so the front toe cord may be a deal killer for me. Can't fault the weight though for the function and comfort you get with these. Note that Bedrock is now selling via REI, and their newest model appears to have a mildly more contoured footbed. 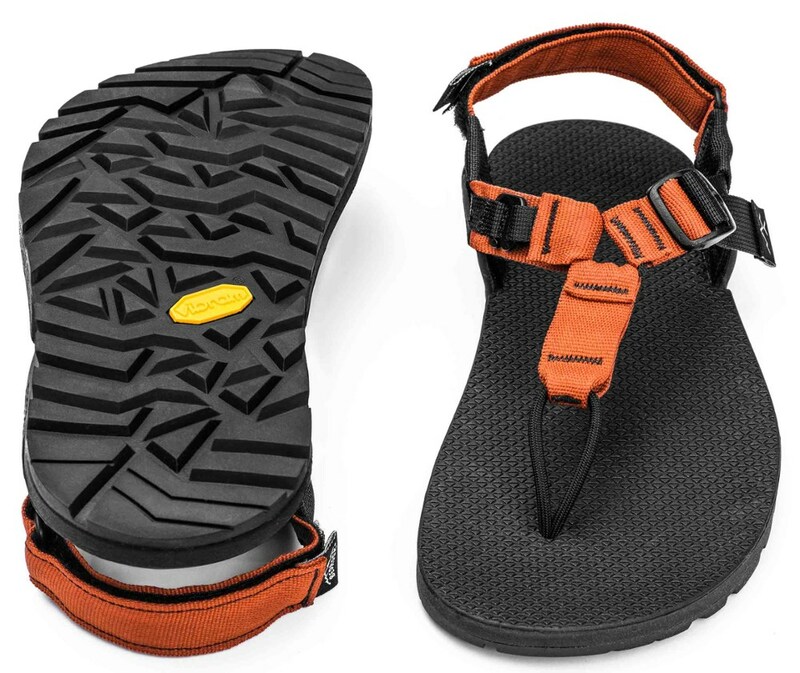 The Bedrock Sandals Cairn Pro is not available from the stores we monitor.